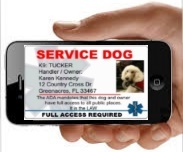 · Although not a requirement, a Service Dog ID badge gives your service dog instant credibility by clearly stating that your dog is a service dog. 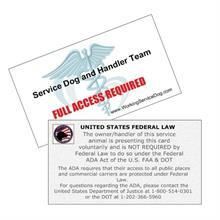 · Service Dog ID cards and Service Dog handler ID cards have The United States Federal Laws on the back, including the United States Department of Justice’s phone number. · If you prefer you can mail us the photo, instructions will be in your order confirmation email. · The Department of Transportation lists service dog identification cards at the top of their list and only verbal assurance is at the bottom. · Service Dog ID badges can dramatically speed up your process of getting through airport security, entering stores etc. without arguments or confrontations. · Carriers shall accept as evidence that an animal is a service animal. Identifiers are classified as identification cards, other written documentation, and presence of harnesses, ID tags or the credible verbal assurances of a qualified individual with a disability using the animal.